Heir Island (also called Hare Island) is the third largest of an archipelago of islands in Roaring Water Bay off the south-west coast of Co. Cork, often referred to as Carbery’s Hundred Isles. In Irish, Heir Island is Inis Uí Drisceoil. The O’Driscolls were the main sept of the Corca Laoidhe tribe (pronounced Corcalee), who, at one time, controlled the area between Kinsale and Kenmare Bay. By the end of the fifteenth century their territory was much reduced. By 1601 and the defeat of the Irish Earls at the Battle of Kinsale, the O’Driscolls controlled only three small areas. 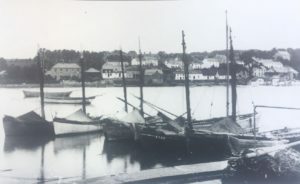 Collymore was the land south of the Ilen River from Skibbereen to Baltimore and included the two largest islands of Sherkin and Cape Clear. Collybeg, the north side of the Ilen, consisted of the civil parishes of Aughadown and Kilcoe, with Heir Island and the Skeam Islands. The O’Driscolls built many tower houses, usually called castles. In Collybeg, they built only one, Rincolisky, known today as Whitehall Castle. The O’Driscoll chieftain resided in Baltimore in Dún na Séad castle (now restored). Ó Driscoll Óg of Collybeg was next in line to the leadership. He was the Tánaiste (second in command). The name Heir probably derives from the Irish Inis an Oidhre (the island of the heir). Heir Island, about two miles long and a mile wide, is separated from the mainland of Aughadown by a narrow stretch of water, the nearest point being Cunnamore, from which there are regular ferries to and from the island. The main pier on Heir is at the eastern end. There is an undulating road the full length of the island. In the middle of the island, there is high ground from which there are magnificent views; north is the Mizen peninsula and Mount Gabriel. From there is a descent to the Góilín inlet, which almost cuts the island in two. This is spanned by a narrow bridge which was constructed about 1910. West of the Bridge was at one time the most populated part of the island, and is often called Paris (probably from a corruption of the term Fish Palace, where pilchards were pressed to make fish oil). 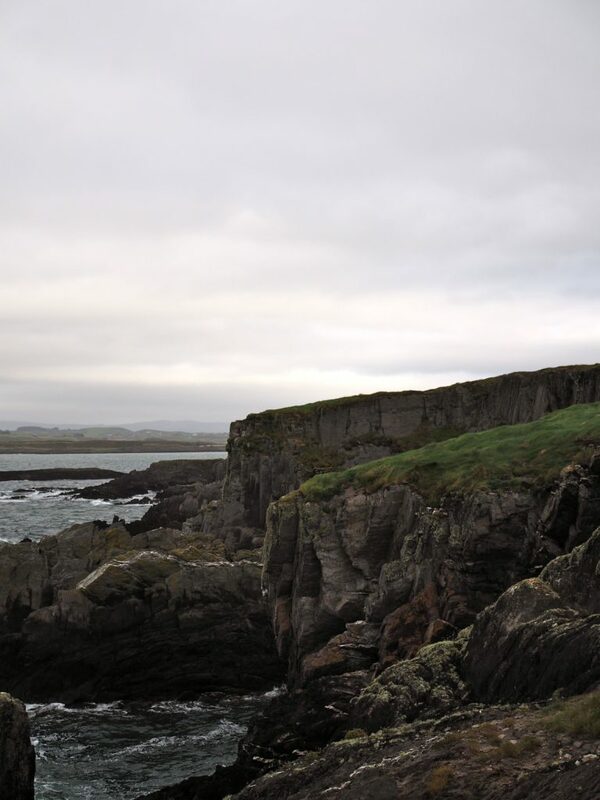 There is a gentle rise then to the Dún headland, almost separated from the rest of the island by two deep inlets, Faill a Dúna, (the cliff of the Dún) and Faill a Bhrághaid, (the cliff of the gorge). From the Dún there are magnificent views, almost 360 degrees, from the Mizen Head right around to Baltimore and including all the islands, off shore rocks and skerries. There are no townlands on the island; it is divided into the Eastlands, the Midlands, the Westlands (Paris). The fourth is the Reen headland which projects southwards towards Sherkin. On the Reen are the finest sandy strands, suitable for swimming, picnicking, yachting. On the eastern side of the Reen is the magnificent Trá Mhór and on the western side the two Trá Báns. Lobsterboats in at Kinsale to sell their lobsters. This photo, from the Greene Collection, was taken sometime between 1910 and 1925. Traditionally the islanders were fishermen. There were noted especially for lobster fishing. From May until the end of August they fished for lobsters and crayfish all summer long. Their fishing yawls were about 20 to 25 feet long, powered by sail and oars. These were open boats; they constructed a type of tent at the prow of the boats, the towel sail, under which they sheltered at night. They usually worked from Monday to Saturday morning when they came ashore. 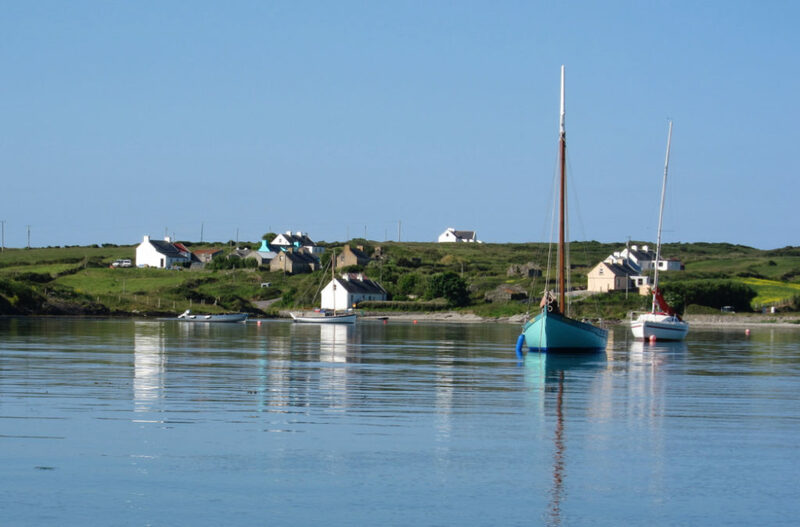 Their iconic boats have been revived by Hegarty’s Boatyard, Oldcourt and now sail in Roaring Water Bay again. Heir Island is perfect for swimming, sailing, relaxing, fishing. The pace of life is slow, so it is a perfect place to unwind. The scenery varies from the high rugged cliffs of the Dún, to the cosy fields between the rocks, to the reed beds in north Reen. Since much of the island is unspoiled, there is a wide of range of flora and fauna. For example, beautiful orchids thrive on Heir; stonechats are plentiful and you can hear the warbling skylark, now gone from most of the mainland. 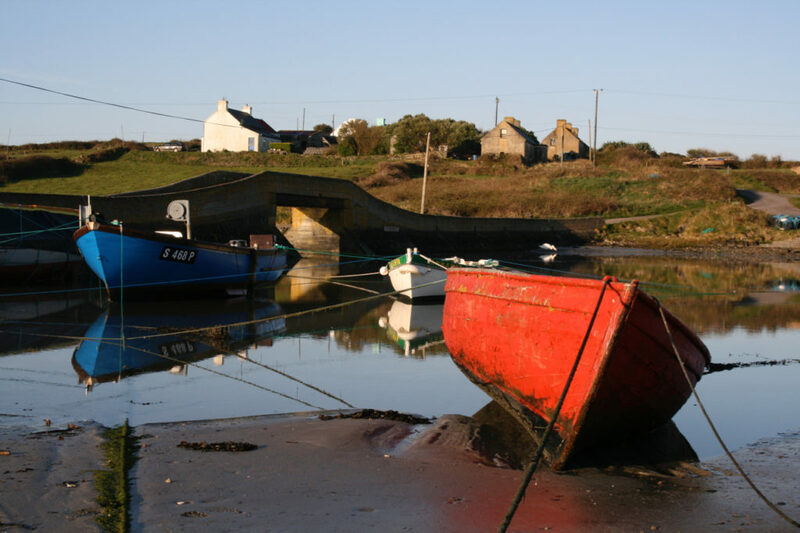 If you need help and advice on connecting with your island roots, you may wish to contact Tadhg O’Driscoll at tadhgsnbclon@gmail.com.